Hi i would like to know how to make a shooting star column. Please help me with the illustration, many thanks. That is a beautiful balloon decoration! You'd first have to create two sturdy and sufficiently heavy bases. 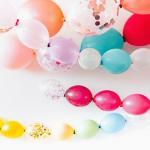 You could either order them from a specialized balloon supplier, or you can make them yourself. 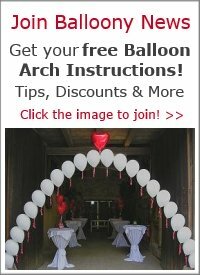 We have step-by-step instructions for a balloon column base. You should however make your base heavier, for example by using steel plates instead of plywood, or by tying the plywood to a concrete tile. Next step is to create the frame. Best is to use 1/2" PVC pipe. To bend the conduit in shape, some decorators use a hand held torch or a laminate tile floor blow dryer. You would heat up the PVC in the area you want to bend. You need to wear gloves because it gets hot. When the pipe becomes flexible you bend it to the desired shape or angle you want. Once you have the base and the frame, you attach the balloon clusters in a certain way so that you achieve the spiral pattern. 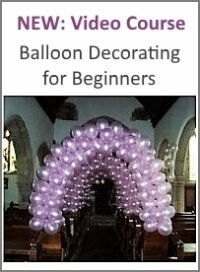 We explain how this works on our page about how to make a balloon column. 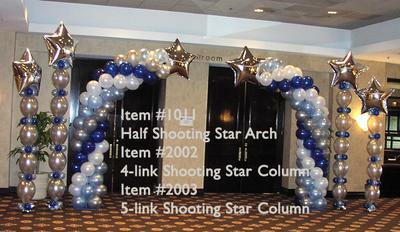 I would love to see a photo of your shooting star balloon arch! Wow.... I really appreciate your swift response and detailed illustration!! I will post my balloon decoration here soon. 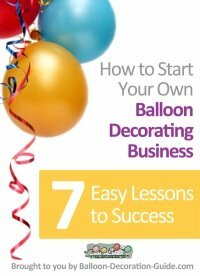 Though I'm newbie in the balloon decoration but you have made it much fun and easier to learn. Many thanks.